Today, we are very excited to announce the general availability of Azure DevTest Labs: your self-service sandbox environment in Azure to quickly create dev/test environments while minimizing waste and controlling costs. That’s why we build Azure DevTest Labs, where you can get your fast, easy and lean dev/test environments specifically for your team and on demand. 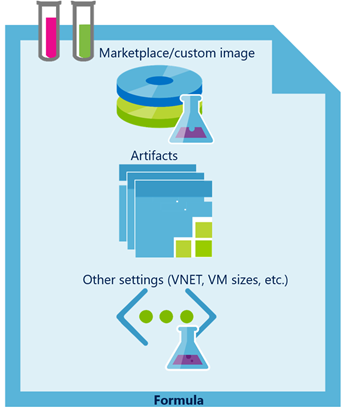 Flexibly define the VM bases through three different ways to boost your environment provisioning: Azure Marketplace images, custom images (your own VHD) and formulas (a reusable base where VM creation settings, such as VM image + VM sizes + virtual network etc., are pre-defined). Reusable artifacts in DevTest Labs allow users to run VM extensions and install tools, deploy applications or execute custom actions on demand once a lab VM is created. The lab policies and the Azure Role-Based Access Control (RBAC) model in the lab enables a sandbox environment for developers and testers to provision their own environments without unexpected accidents that can introduce a big bill. ARM templates are fully supported to deploy labs and resources in a lab. Reusable custom images and formulas can be created from an existing VM, and artifacts loaded from VSTS Git or GitHub repositories can be used cross different labs. 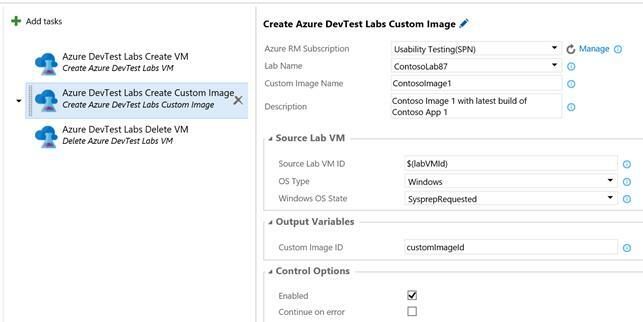 In addition to APIs and command line tools, Azure DevTest Labs Tasks are available in Visual Studio Marketplace to better support your release pipeline in Visual Studio Team Services. There are three tasks that allow you respectively to create a lab VM to run the tests, save the VM with the latest bits as a golden image, and delete the VM when it’s no longer needed after the testing is done. You can get a high-level idea around these four aspects in three minutes by watching the video What is Azure DevTest Labs or, read our official announcement at the Azure DevTest Labs Team Blog for more details. 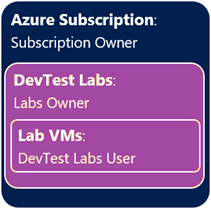 Try Azure DevTest Labs today, and let us know what you think about it! If you have an idea for how to make it work better, submit your feedback (or vote for others) at the Azure DevTest Labs feedback forum. Questions? Refer to the MSDN Community forum for answers. To get latest information on the service releases or our thoughts on the DevTest Labs, check out the Azure DevTest Labs Team Blog and subscribe to our Service Updates.